Bauernroulette is a variation of a roulette game that originally comes from Germany. The name of the game itself means that this is a game 'for the poor' just as German word "Bauer" means 'peasant' or 'farmer'. Truly, Bauernroulette was mostly played by peasants who could not afford playing roulette at a casino. This fun roulette game has become very popular in Germany. Nowadays it is also possible to play online bauernroulette, but the impressions will of course be different. Although the components of bauernroulette differ from those in the traditional roulette model, it preserves the principles of the roulette casino game. 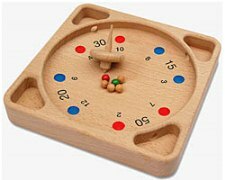 The game of bauernroulette is played on a special wooden circular surface with hollow slots in it. The wheel itself is quadratic or (in newer versions of the game) octagonal in shape and has four (or eight) hollow bowl-shaped chambers in each corner outside the playing surface. The other components of the game are six balls (4 are white and the other two - red and green respectively) and a spinning top. To win in the bauernroulette is to spin the top and send all balls into the hollows and eventually into one of the chambers outside the playing surface, which brings the highest points. 1. The players place the six balls in the center of the circular surface. 2. The spinning top placed in the very middle of the surface is pun by one of the players and sends the balls in different directions around the surface and into the hollows or chambers. Some players are said to be able to set the top spinning for over thirty seconds on end. 3. Each hollow or bowl the balls may land in is associated with a certain value. The points for each ball that has landed in the hollow are added respectively. 4. The points for the red ball landed in a hollow must be added. 5. The points for the green ball are subtracted from the sum of points made by other balls. 6. If the balls land outside the playing surface, they don't count in the game. 7. The player, whose balls have scored, spins the top in the next round. 8. When one of the players gets maximum points, he or she wins. The maximum point total usually makes 1000 points. It is agreed beforehand for each game. As you can see, Bauernroulette has few betting options compared to that in European roulette or any other classical variation of the roulette game. It is, as it was mentioned, a game for fun. As the size of the playing surface is rather small, Bauernroulette can be played at home in a small company of friends. This game is easy to play and will suit players of any age and skills.